In a recent interview with Zelda producer Eiji Aonuma, it was said that a 2D Zelda title on the Nintendo Switch was definitely a possibility, but by no means was this confirmation that it would happen. And quite frankly, I hope it doesn’t. Now just to be clear, I have nothing against 2D games or even 2D Zelda games. There’s nothing wrong with them and I have fond memories of them. But the thing is, console Zelda games have been 3D since Ocarina of Time on the Nintendo 64. Handheld Zelda games on the other hand were 2D due to the limited power of the hardware. And this continued throughout the generations. You got 3D Zelda games on home consoles and 2D Zelda games on handhelds. Now the two have merged and they have a powerful hybrid device with Breath of the Wild as its first Zelda game. Breath of the Wild is a benchmark for the franchise just like Ocarina of Time before it. It has voice acting, it has cinematic cutscenes and seemingly a story that justified all of those advancements. And then you’d have a 2D Zelda game that is cheaper, that is smaller scale, that just doesn’t have those advancements that Breath of the Wild made. That frustrates me. See, when it comes to gaming I want to see developers move forward. And that is exactly what Nintendo has done with Breath of the Wild. It’s more than a match for the grand RPG experiences you’d find on other consoles. 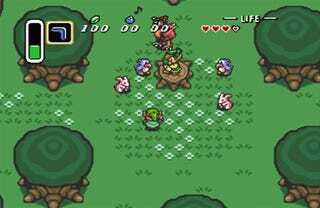 Nintendo brought the franchise forward and redefined the Zelda series. A 2D Zelda game for Switch wouldn’t do that. All that forward progress would be tossed aside to create a simpler experience that looks more at home on the portable screen, and looks like a glorified GameBoy game on the TV screen. I know many of you probably disagree with me on this. I’ve had plenty of conversations with all of you and the general consensus seems to be that people prefer to leave things the way they were and definitely love themselves a good dose of nostalgia. I just can’t get into the nostalgia.